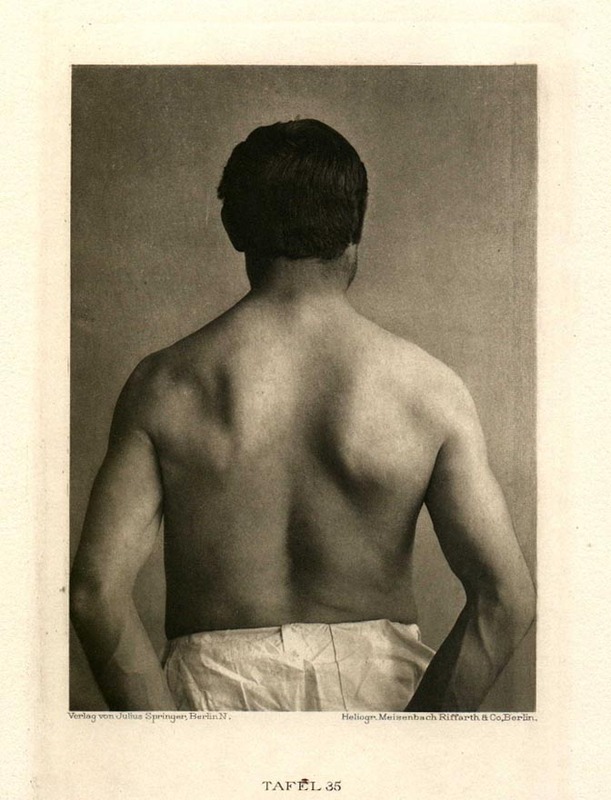 Atrophic paralysis of muscul. infraspinat. sin. 31 year old laborer. Onset of the illness one year before photographing, with no verifiable cause. The photograph gives an extraordinarily precise picture of the affection. The regio infraspinata sin. deeply cratered, nearly empty. Furthermore, the tentative hand seems almost to touch straight through to the bones. The same mutation on the right side, less advanced. Comparative onset of serratus paralysis: lower angle of the shoulderblade pulled up, approaching the spinal column, medial border of the shoulderblade skewed, criss crossing from out and above to below and in. Atrophic wasting in the left musc. supraspinat. and again in the deltoideus sin. in its portio spinal. and acromalis. The musc. infraspinat. sin. gives a significant degradative response even in the better preserved portions.